The Running Therapist. : Welcome Back readers! 2012 off to a great start. Welcome Back readers! 2012 off to a great start. Don't worry, I missed you all too! The good news is that I'm back for another season of training, racing and more importantly, Writing! I can't wait to share some more of my thoughts and experiences as this season is already well under way. First off, I'd like to explain where I've been. I lost my sister this past summer and had to go back to Ontario to be with my family. It was not all bad news though as I also got to finally meet my son Isaiah. He's now five years old and growing up so fast! As I was there I got a job offer from a friend all the while was battling a slight foot injury. None the less a very mixed up and busy summer. 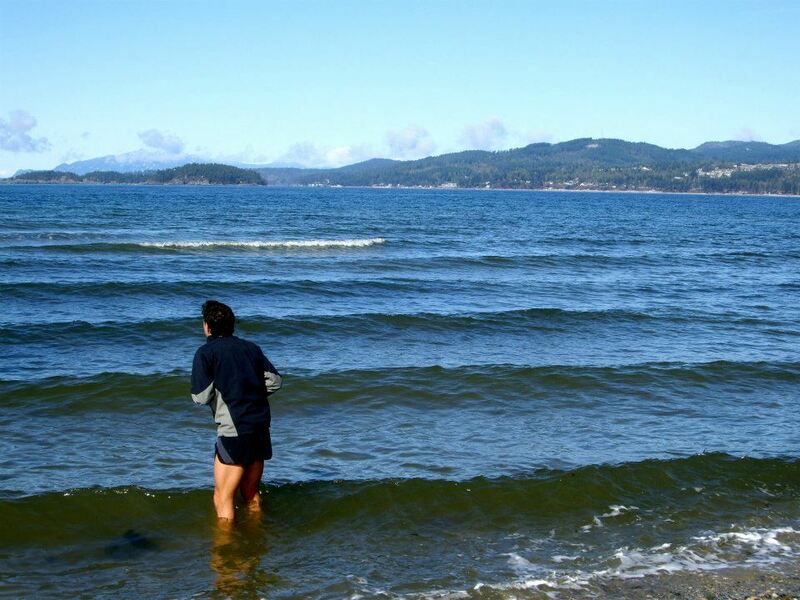 Once I returned to Vancouver there were a couple of weeks of sun soaked relaxation on my favorite Wreck beach and then off to work at Sigge's for another ski season. This season was especially busy at Sigge's as I took on a bit more responsibility and we had a pretty decent season business wise. Our ski tech left us just before Christmas so I had to pull double duty as a tech and run the sales floor. That meant going in early and staying until at least close. This season started off with a lot of skate and classic skiing. I was helping to organize the Tuesday night race series at Cypress Mountain or the TNR as they have been abbreviated to. I had a lot of fun with it and it allowed me to get regular training in so I could do the Sigge's P'ayakentsut Ski event on February 25th. That's another blog though. 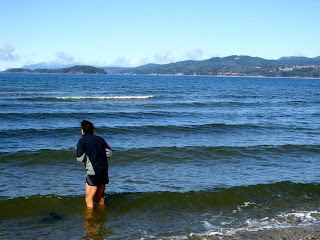 This blog has really been sparked because of my recent performance at The BMO Fools Run Half Marathon in Gibsons, BC. This is a race which I have taken part in for four years in a row now. 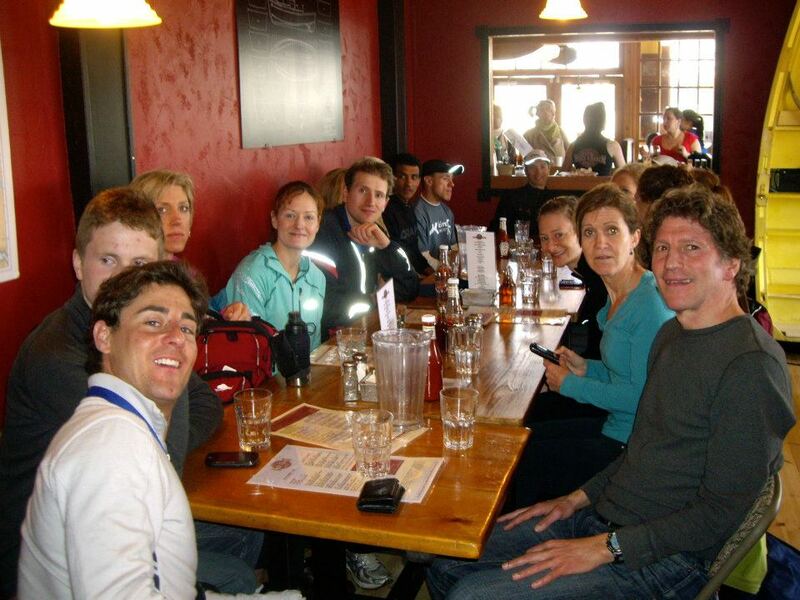 The race director Teresa Nightingale has always been very accommodating and the race is challenging, well organised and well attended by many of my Vancouver Falcon Athletic Club team mates. In 2009 I placed 3rd. In 2010, I placed 4th. In 2011 I placed 2nd and I knew 2012 had to be my year! I was awarded bib #1 as Kevin was not there to defend his title and I placed 2nd last year. For those of you who don't know, it's an honor to wear the bib #1. It's like the rainbow jersey in world cup or the yellow jersey in the Tour de France. 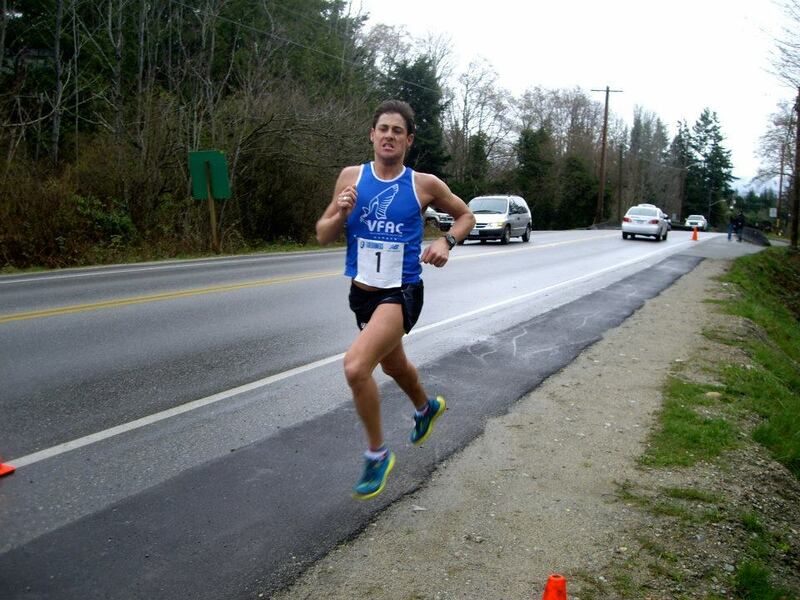 This race was a test for Vancouver BMO Marathon. I was super stressed out prior to this event as I was having problems with my body's muscular balance due to a tweaked lower back done at the last Tuesday night ski race on March 20th. It was a small non harsh fall on my classic skis and it ended up making my hip compensate for a very sore back. In turn, that made for a harsher impact on my outside arch which created something called cuboid syndrome:( It took a week of high mileage for this foot injury to develop after the initial back tweak. I tried everything in the book for relief but it was excruciating. Good thing I had a couple of days off work. I went to see my team mate and Physio therapist extraordinaire Ramsey Ezzat . He assessed the problem and adjusted my foot and stretched a few things out. After that we went through some exercises to help stabilize the imbalance and bring things back into alignment. He taped my foot up and off I went on my road to recovery. Proper technique is essential to training muscles properly so I made sure to listen acutely. I have been doing those exercises 2-3 times a day to try to get back to normal as quickly as possible. Through the next couple of days I tried everything to get my feet back to normal including those exercises, diet, rest, elevation, ice and massage. By the end of the week things were feeling solid. I went for my traditional 5k easy run with 4X 100 meter strides the day before the race. I came home feeling pretty happy about the run. I took the tape off and jumped into the shower. By noon at work my foot was starting to ache. I took my shoes and socks off and went barefoot at work as it seemed to relieve the pain. There were two times where pain shot up through my foot and into my leg and I thought I would not be able to run the next day. As the day went on things settled down and after the evening was through it was feeling better. Sally and I were kindly billeted for accommodation with the same lovely family that took me in last year. On our way from the ferry we stopped off in Gibsons to see Ramsey who was staying with friends who were also a group of runners taking part in tomorrow's race. He had kindly offered to treat me the night before the race to make sure I had the best chance of a good performance. As an athlete Ramsey understands the work that goes into training for a given event and the need to be in good shape for the performance. He treated me again and topped it off with another tape job and it was off to bed to be race ready. Race morning was cool and slightly overcast. I arrived at the community center to pick up my race package and chatted with my coach John Hill and all of the runners I knew before I had to go for my warm up. I just love the pre-race excitement and energy as runners from all around get together for a test of strength and endurance. Mutual respect among runners of all abilities is abundant and flowing as everyone mingles and anxiously or excitedly awaits their on course adventure. The foot was feeling pretty solid and I intended on racing until my foot (hopefully not) gave me any problems. I knew up until two nights prior to the race that I was a favorite to win until I read that Graeme Wilson would be there to defend his two year title. (2007 and 2009) I was excited to have him there because I thought I might have a chance of sticking with him for a great time. I have a lot of respect for Graeme as his race times are nothing short of robotic. It seems as though even if he is having a rough day, he still pulls in a great time. I often refer to Graeme as being able to run a 2:30 marathon in his sleep. 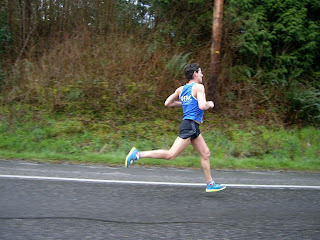 I knew if I could stick to him in this race that I would surely be able to keep him in my sights during the 2012 BMO Vancouver Marathon. As the gun went off I was immediately in the lead for the first 400 meters up the first hill and around the corner. I couldn't see Graeme, but I was accompanied by Drew Nicholson ( My team mate and training partner) I asked him about pacing as I had left my Garmin at home accidentally. He told me we were running 3:30/km. We were on the flats and within the first km and I knew it was slow so I said that it seemed slow and not a second later did Graeme come through into the lead. I gave a perfect symbol with my hand and sucked right in behind the race veteran. We turned into the first downhill section and the stride opened up a bit and I could tell it was on! There were a couple of changes in position but I still just wanted to sit in and see what was going to happen with Graeme. I knew Drew would be there for the first few kilometers and could see that the local favorite Shaun Stephens-Whale was here on business! 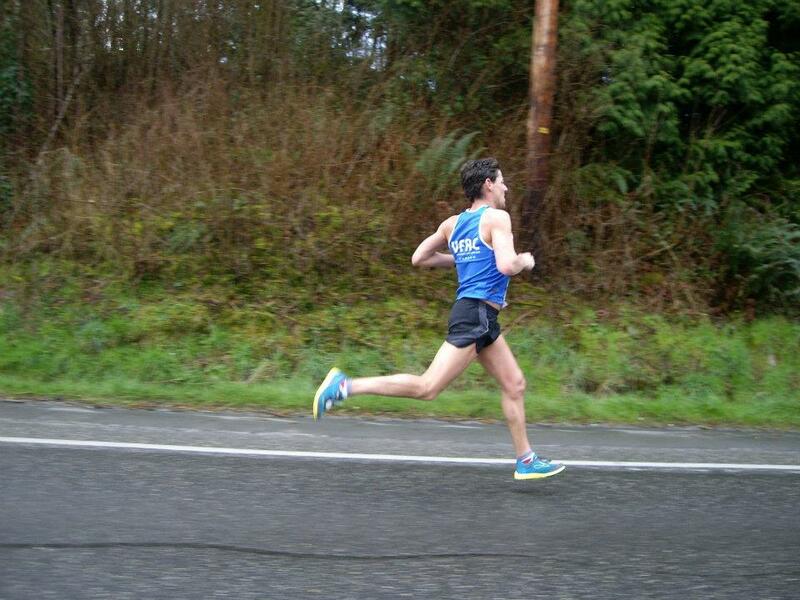 I had raced Shaun last year at the First Half Half Marathon and he had some great potential. Four kilometers down now as we started our incline back to the highway and I remembered from Kevin O'Connor's pace last year that this race didn't feel anything close to the battle I was fighting the year before. I settled in taking the slower pace as a gift from my competitors. We cruised through the first water station and I offered Graeme the first grab at the water. As it turns out, our side only had Gatorade and I was looking for water so I missed out on water at 5k. No worries, It was cool and I was well hydrated. Shortly after, Graeme and I had a short chat about race pacing and such and it was now known to me that Graeme planned to run the first part of this race conservatively as to push hard for the last 8 or so kms. He told me to run my own race. I was a little stunned to hear his race plans up front and saw the open window. As we topped the hill and rounded the corner onto the highway I dropped the hammer and took off as fast as I could. This was the first time I would use the surge tactic in a half marathon during the beginning of a race as I knew it was the only chance I had to win it. After running this race three years previous I had gained a lot of know how and know course which really helps in planning how to run the course. Based on the course profile and O'Connor's performance from last year I knew that the next flat few kilometers would be the best chance of any to grow any lead. As I approached the first big downhill at around 7k I looked over my shoulder for the first time to see if anyone had responded to my sprint. It seems as though I had gained a little bit of a cushion for my efforts. My strategy was to use all of the big downhills to my best advantage and keep myself as smooth as possible while at the same time trying not to re injure my foot.. 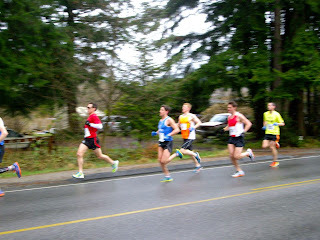 I felt better as the race went on and the kilometers seemed to fly by in no time. When I hit 10k My time was 33:20 and I knew I was on pace for a decent run. 12 kms came in 40 minutes even and 13 in 43:18. As I approached Roberts Creek I felt calm come about as the crowds and familiar surroundings made me feel some comfort knowing that the beginning of the hill would soon be underway. My times and my body were clicking and I felt great! It was now a time for preparation as our climb from the ocean back up to the highway was sure to kill some of that time I had fought for already. I knew that in a few minutes I would have Graeme's after burners chasing me down. He has the vet's advantage and he's fresh from his relaxed start and I'm a little tuckered out from pushing down those hills. I knew if let off for a moment I would be a running target for him. There was a time when the pain first started to come on just before the main uphill back to the highway. Shortly after the pain started to set in the Coast Cable van pulled along side me with their side door open and the camera man hanging out filming me. Instantly I felt a surge of energy as I knew I had to wear my club colors proud and get my form together for TV. It was perfect timing as they disappeared just as I wanted to get back into my head. Conquering these hills takes a fair amount of talking to one's self. Without the occasional self pep talk, these hills will surely get the best of you. I was glad to get to the top of the hill and be on the highway again. Because of my ambitious first half I could certainly feel the lack of recovery in these final few lagging inclines. Luckily by that time Coach Hill had caught up with my support team. (Sally, Coach and Jono) I had plenty of encouragement and downhill action to get me through to the finish. I knew I had already won the race even though I had lost some ground on the uphills but at this point, I knew I had a chance to set a knew PB and possibly break into the seventy minute bracket. From then on it was me against the clock. There was a very rambunctious crowd of youngsters at the bottom of the last long hill going into Sechelt"s first and main part of town. It made me very happy and gave me at least 900 meters of great energy. There were two kilometers of fairly flat course to grind out to the finish. The most welcoming sight was certainly the 400 meters to go sign. As soon as I saw that, all my pain disappeared and I pictured myself on the track on a sunny Saturday morning with my team mates with only one lap left which made the pain all that more capable. My coach was yelling at me to push if I wanted to make Sub 71 and I had it! I accelerated to my maximum speed and rushed for the line. I could see the clock at the last minute and pumped my fist in excitement for my new record 1:10:57. I let a few loud yells out as I was overpowered with satisfaction and embraced my achievement. It was the first time I had won by such a margin in such a tight race so it seemed weird and slightly lonely as hung around the finish chute on my own. Of course Teresa was the first on scene to congratulate me and hand me my finishing medal. Shortly after my girlfriend Sally and Coach came to my side with hugs and celebration all around and I got a quick interview from the Coast Cable people. It was all very exciting! Graeme came into the finish chute just under a minute behind me. I welcomed him in with a handshake and we waited for Shaun who wasn't far behind. I stayed around to watch the top female finishers come in (Lisa Brooking, Kristin Smart and Gillian Clayton) They all respectively won their age groups as well!! I'm always impressed with the talent of the women as they tackle this course! The masters men and women were also a feat but surely the women were best with Rebecca Reid, Mary Walsh and Helen Ritchie. After a short post race warm down run with Shaun, I worked my way back to the finish area for a bagel with cream cheese and jam and coffee. Mmmmm, I was happy to have that. We made our way to the beach for the traditional post race ice bath in the chilled ocean. Wow was it cold! I had to take it in small doses it hurt so bad. After that we headed back to check results and get warmed up with some more great soup and burritos! 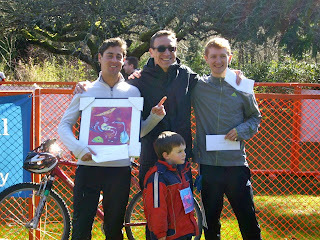 It was great to win some cash and a framed saboothroyd print during the award ceremony. 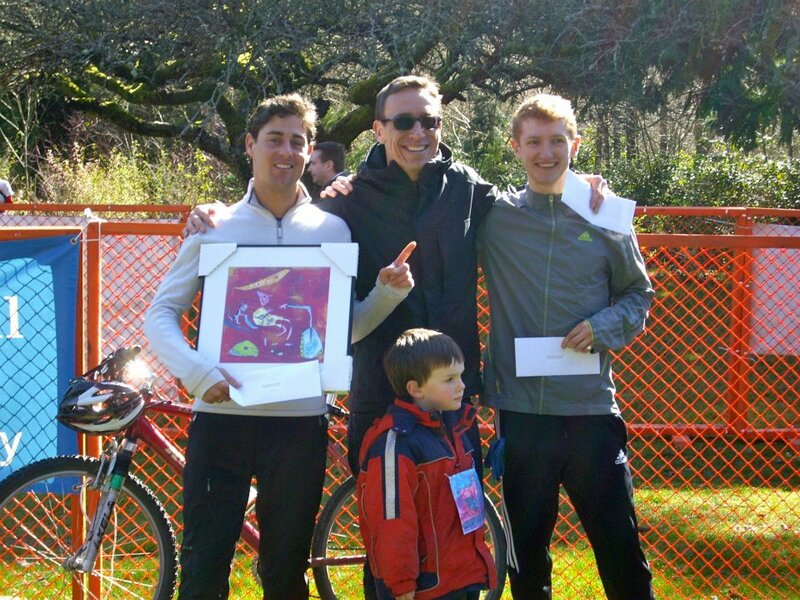 I appreciate how smoothly the race went as the age group awards were picked up separately from the awards. This made the whole post race experience perfectly timed for travel food and just pulling oneself together after such a shock to the body. Molly's Reach for the post race celebrations. The post race VFAC social was hosted at Molly's Reach. I was happy to be there with no where else to go! Everyone was buzzing with their post race excitement. 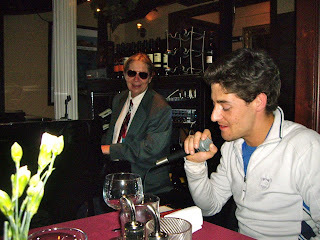 We took over a large portion of the restaurant as usual and the food and drink and stories began to fly!! It was sad to see everyone take off so quickly as I felt ready to party and everyone was dashing for the ferry. Luckily I had a few warriors decide to last the sunny day out on the coast. We were invited back to Shaunna and Mike's for some wine and to share stories as because of my late arrival the night before we never had time to catch up. after we had eaten all their cheese and drank all their wine we kept moving along the coast. We took Marine Drive back through Gibsons and to the ferry which was a pleasant route Perfect ferry timing for once!